"We can hear the universe!" This was the triumphant proclamation at a February 2016 press conference announcing that the Laser Interferometer Gravity Observatory (LIGO) had detected a "transient gravitational-wave signal." What LIGO heard in the morning hours of September 14, 2015 was the vibration of cosmic forces unleashed with mind-boggling power across a cosmic medium of equally mind-boggling expansiveness: the transient ripple of two black holes colliding more than a billion years ago. The confirmation of gravitational waves sent tremors through the scientific community, but the public imagination was more captivated by the sonic translation of the cosmic signal, a sound detectable only through an act of carefully attuned listening. As astrophysicist Szabolcs Marka remarked, "Until this moment, we had our eyes on the sky and we couldn't hear the music. The skies will never be the same. "Taking in hand this current "discovery" that we can listen to the cosmos, Andrew Hicks argues that sound--and the harmonious coordination of sounds, sources, and listeners--has always been an integral part of the history of studying the cosmos. Composing the World charts one constellation of musical metaphors, analogies, and expressive modalities embedded within a late-ancient and medieval cosmological discourse: that of a cosmos animated and choreographed according to a specifically musical aesthetic. The specific historical terrain of Hicks' discussion centers upon the world of twelfth-century philosophy, and from there he offers a new intellectual history of the role of harmony in medieval cosmological discourse, a discourse which itself focused on the reception and development of Platonism. Hicks illuminates how a cosmological aesthetics based on the "music of the spheres" both governed the moral, physical, and psychic equilibrium of the human, and assured the coherence of the universe as a whole. With a rare convergence of musicological, philosophical, and philological rigor, Hicks presents a narrative tour through medieval cosmology with reflections on important philosophical movements along the way, raising connections to Cartesian dualism, Uexküll's theoretical biology, and Deleuze and Guattari's musically inspired language of milieus and (de)territorialization. Hicks ultimately suggests that the models of musical cosmology popular in late antiquity and the twelfth century are relevant to our modern philosophical and scientific undertakings. 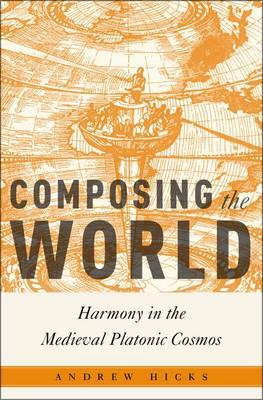 Impeccably researched and beautifully written, Composing the World will resonate with a variety of readers, and it encourages us to rethink the role of music and sound within our greater understanding of the universe.